Habitat: Elder is native to Europe, northwest Africa, southwest Asia and western North America. Description: Elder is a deciduous shrub or small tree growing to 4-6 m in height. The leaves are opposite, 10-30 cm long with five to seven leaflets. The leaflets have serrated margins. The flowers are five-petaled and white in color. The fruits are small, black to dark purple berries, produced in drooping clusters. Elder berry is in fact a berry-like drupe, with three to five single nutlets. Parts used: Bark, leaves, flowers, berries. 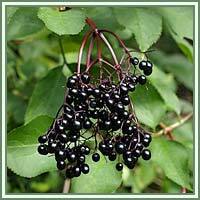 Medicinal use: Elder is considered to have antiphlogistic, cholagogue, diuretic, diaphoretic, expectorant and laxative properties. There is a great variety of its medicinal uses. Extracts from the berries and flowers are commonly used in cases of common cold, influenza, fevers, sinusitis, rheumatism and sciatica. Elder is an excellent detoxifier, and as such, it can be used to clear skin infections (acne, boils, rashes) and as a general astringent. Remedy made from the flower tops is used to fight different sorts of allergies, ear infections, fungal diseases, and in treatment of different respiratory complaints (such as tonsillitis, laryngitis and flu. Infusion made from the flowers can also be effective against measles and chickenpox. Dried root is an excellent herbal remedy for dropsy. 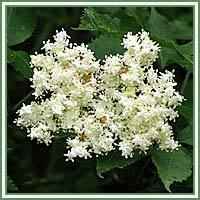 Safety: Elder shouldnâ€™t be used without an expert supervision because it could cause nausea and vertigo. Some herbs could react with certain medication. Therefore it is advisable to contact your doctor/herbalist before consumption of any herb.